Imogen's Typewriter. 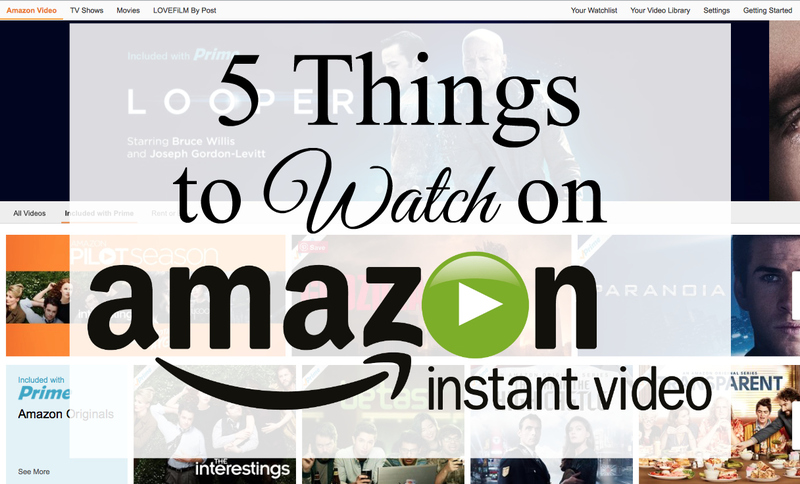 : 5 Things to Watch on Amazon Instant Video! It's Amazon Pilot season! I think? They seem to have these every couple months. This is where they put out a few pilots, (two dramas and four kids shows currently) you watch them and fill out a little questionnaire if you're so inclined about what you liked/ loathed/ want to see more of. Interestingly, both dramas this time around are based on books! The Interestings is based on the book by Meg Wolitzer and is a multi-decade look at a group of friends. And The Last Tycoon is based on the F. Scott Fitzgerald book and has Matt Bomer and Kelsey Grammar. It's almost enough for me to pass by the grossness of F. Scott Fitzgerald as a person. I'm a little all or nothing when it comes to reality TV. I love Jersey Shore, I hate Geordie Shore. I love the Great British Bake Off, I hate Cupcake Wars. UnREAL is different in that it's a fictional show based behind the scenes of one of those dating competition shows. It's fascinating. All the manipulation of candidates, all the drama, all the background things we don't see, and great flawed characters that you just love to hate! Didn't think I'd miss a chance to plug the show I love, did you? Season 1 to 5 of The Walking Dead is on Amazon Instant Video and that is quite a marathon. Unfortunately, watching it back-to-back makes the continuity issues blindingly obvious (the walkers using rocks and turning doorknobs, anyone?) but you'll never be bored. And when you watch, you can always tweet me about it because I never miss a chance to talk zombies. Fear The Walking Dead is a pretty nice prequel too, featuring a vaguely familiar face for you Harry Potter fans. It's rare that I get truly sad over an overlooked show. Fringe, Falling Skies, Death in Paradise, they all deserve more attention but none compare to the silence that seems to surround Crossing Lines. The official twitter only has 5500+ followers and hasn't tweeted since 2013. Am I missing something? It's basically a cop show. Except, it's set all over Europe in a cross-borders investigation team. Paris, Prague, London, Luxembourg, it's all covered. It actually really interests me that this team doesn't actually exist in the real world because it's so easy to get around Europe with a European passport. This is obviously wonderful but if you committed crimes in several different countries, nobody is specifically looking out for those patterns. If anything, watch for my favourite actor/ shameless crush Tom Wlaschiha, also in Game of Thrones and always handsome. Here's the thing about TV, it's really white. I could probably count the POC in the last four shows I mentioned on my fingers. But Empire is about an African American family who run a music company, it has an almost entirely POC cast and an incredibly important LGBT+ storyline. It's refreshing. And even underneath all that, it's a really good watch. If you watch one thing on this list, it should be this and yes, this takes priority over The Walking Dead. I've been bopping along to the soundtrack while I wrote this post and I'm not even a music person. Also, Taraji Henson is on it and she is a queen.